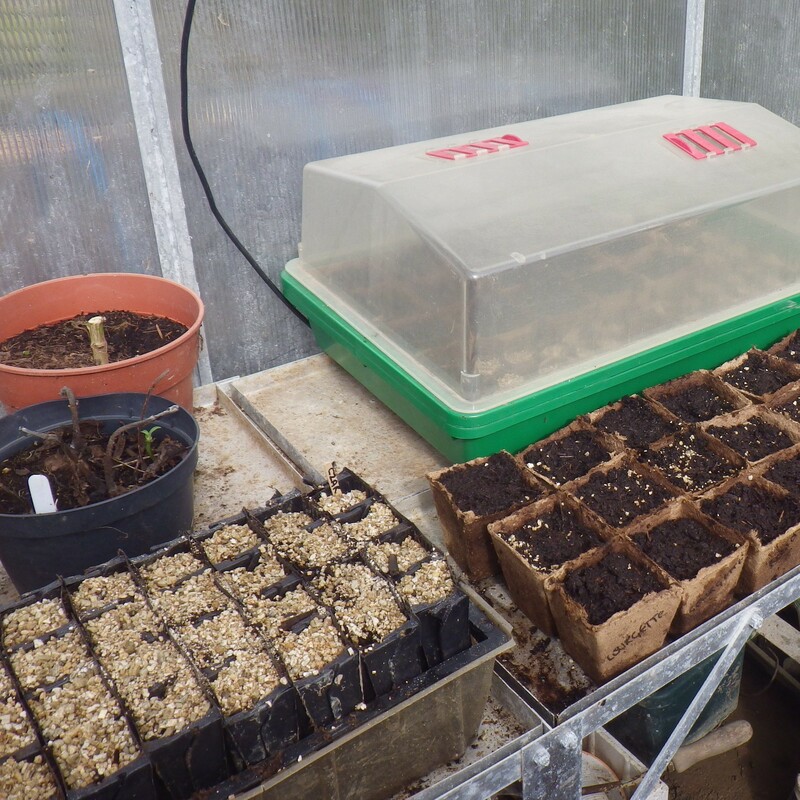 Today I’ve been sowing… I love putting seeds into compost, knowing that such tiny things will transform into the huge variety of vegetables that we’ll be eating later on in the year. Today I planted squashes, pumpkins, courgettes, melons, tomatoes, ground cherry, runner beans and maize. Tomorrow I’ll be focusing on leafy things and starting off some mange tout. Already in the ground are garlic, shallots and some potatoes and there will be more of the latter going in soon. And, having fumigated the greenhouse earlier in the week, I’ve now transferred the peppers and chillis out there to carry on growing. This year I’m trying to focus on using up resources that I already have. In the pictures you can see that most of my curcurbits are planted in coir pots… I bought loads of these years ago and I think that these are the last of the batch. I’ve also done some more planting in toilet roll middles and the beans are planted in some very old root trainers, which are just about holding together… I’m very reluctant to replace them as they are quiet expensive. 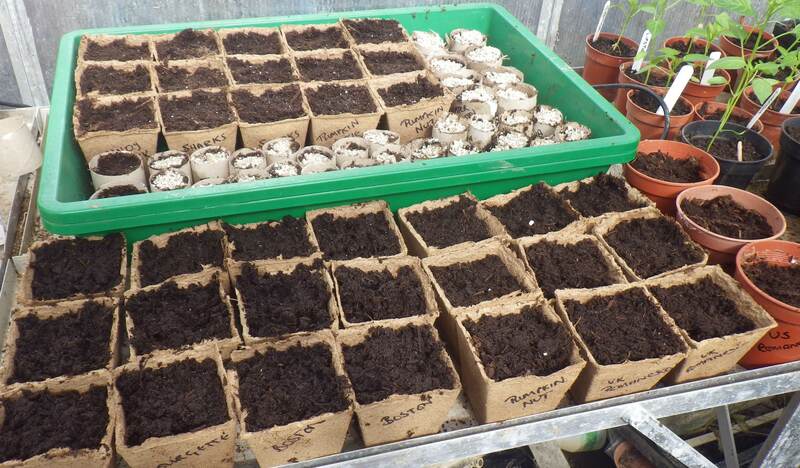 What a lovely time of the year… fingers crossed everything germinates. Oh lovely… I’d love to see your plot! Oh, they do like oriental greens don’t they? But it is the digging that’s so destructive. If you are ever in west Wales I’m sure both Kate and I would be delighted to welcome you! Now the groundwork is in place and the forecast is good, I’ll cross my fingers ffor a bumper crop. Oh, I do hope so… especially now we’re being told we should have 7 portions of fruit and veg each day!!! and I’ve planted some more today… yay me! I love potatoes… especially growing them in a container… maybe some salad leaves in pot would be manageable too? I’m so jelaous of your gardening skill….. I wish I were as able as you are…. I just love seeing things grow… and there is no other feeling like harvesting your own food… even if it’s just some herbs. I know I know ….. it’s exactly that that I’m not capable to doooooooooooooooo!!!!!!!!!!!!!! 😦 😦 😦 I’m trying to persuade my man to try gowing something,maybe he’ll have more sensibility than me…. Sepp Holtzer is very fond of rocks acting as ‘storage heaters’, which yours clearly do… there always has to be a bright side! I think I need to move to somewhere warmer… oh, to be able to grow all those things. Looks like you are having a lovely time in Barbados… I’m so jealous! Come for a visit when I’m home, and smuggle home lots of lovely seeds! There must be a sunny windowsill somewhere that will house a miniature tropical garden…? Hehe… I’d love to visit!